What is a normal range of total eosinophil count? What formula does the absolute eosinophil count calculator use? 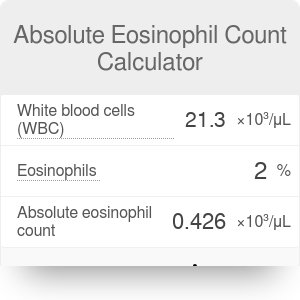 The absolute eosinophil count calculator uses white blood cell count and eosinophil percentage to estimate the total number of the acidophilic cells in one's blood. They are white blood cells specialized in fighting parasites and certain diseases. They are also mediators of allergic responses and are associated with bronchial asthma development - they are used as markers of severity of the disease. The name eosinophil or acidophil relates to the fact that this particular group is acid-loving: they show their affinity for acids by turning bright red after staining with eosin, an acidic red dye used in the standard procedure of microscope probe preparation. The normal total eosinophil count range is 0.04 - 0.45 ×10³ cells/μL. The state of eosinophil count elevation over 0.45 ×10³ cells/μL is called eosinophilia and is linked to allergic reactions and parasitic infections. Hypereosinophilia is a state of elevation over 1.5 ×10³ cells/μL and can be due to the growth of mutant eosinophil cells or severe parasitosis or allergic reactions. A total eosinophil count lower than 0.04, called eosinopenia, can be associated with acute infections, burns, stress reactions, Cushing's syndrome, and use of large doses of steroids. The calculated absolute eosinophil count is expressed in thousands of cells per microlitre (10³ cells/μL). Absolute Eosinophil Count Calculator can be embedded on your website to enrich the content you wrote and make it easier for your visitors to understand your message.